What changes will make the 2020 Subaru Outback different? Everything. Model-year 2020 marks the premiere of the all-new sixth-generation Outback with new styling and very likely new engines, including this midsize crossover’s first turbocharged four-cylinder in place of its six-cylinder. The ’20 Outback will retain its beefed-up station-wagon profile and almost certainly packaging that’s enabled it to challenge and sometimes beat taller-roofed crossovers for usable passenger and cargo room. It should also remain deceptively capable off-road and, thanks to its relatively squat center of gravity, a better ally on twisty roads than most conventionally shaped competitors. The likely demise of its six-cylinder engine for a turbo four, however, will open a new chapter in the Outback story. A Subaru staple since its model-year 1995 debut as part of the Japanese automaker’s Legacy wagon line, Outback has blazed its own trail, blending the styling and car-like driving dynamics of a midsize station wagon with the versatility and all-weather capability of a crossover SUV. Similar-purpose rivals, including the Honda Crosstour and Toyota Venza, challenged it but failed, each discontinued after less than 10 years on the market. Outback outlived both, enduring as Subaru’s most popular vehicle. More remarkable, it has sustained demand even in the twilight of its current design generation. Sales through the first half of 2018 were up more than 5 percent and are on pace to top 180,000 for the year. That would keep Outback in second place among midsize five-passenger crossovers, behind the Jeep Grand Cherokee. Given the pending launch of a redesigned model, we’re inclined to advise waiting for the 2020. You’d get Subaru’s most up-to-date powertrains, safety, and convenience features and Outback styling that’ll look fresh for years. But there’s also a strong argument for grabbing a 2019 Outback. It’s still a highly capable and refined crossover and almost certainly your last chance at one with a six-cylinder engine. Unfortunately, you’re unlikely to benefit much from clearance discounts because dealers are selling every ’19 Outback the company can build. Like the ’19, the 2020 Outback will occupy showroom space with Subaru’s new-for-2019 Ascent, a longer, taller and more conventional midsize crossover with three-row seating for up to eight. The ’20 Outback lineup is likely to adopt the Ascent’s trim-level designations: Base, Premium, Limited, and Touring. As with the outgoing model, count on all-wheel drive (AWD) being standard across the board. Yes, but probably not dramatically so. With its “wagon on stilts” design, Outback has built a strong identity. Expect the ‘20 to draw inspiration from the Ascent, with a large hexagonal grille, slightly elongated headlights, and a hood with a slightly raised center section running front to back. Its side profile should be a marginally more expressive version of the 2015-2019 model’s. 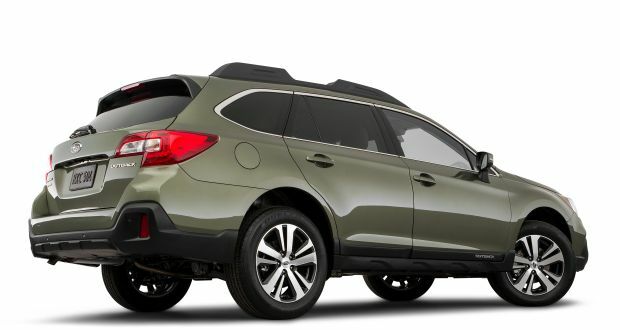 Expect a more upright tail than that of the outgoing Outback, probably with larger tail lights and a prominent chrome strip across the liftgate on upper-trim models. We hope Subaru doesn’t muck about with the interior, long an Outback asset. Expect designers to add some visually interest with new elements on the door panels and dashboard. The instrument cluster, steering wheel, and infotainment and climate controls probably will take some inspiration from the Ascent’s clean and simple layout, as well. Most important would be for designers to insure Outback retain its terrific use of interior space. The seats will hopefully remain long-haul comfortable, with ample headroom and legroom for front and rear occupants. We predict cargo capacity will not deviate much from the outgoing Outback’s outstanding 35.5 cubic feet with the rear seatbacks raised and 73.3 with them folded. Yes, and they’ll be some of the most dramatic updates. The 2020 Outback will adopt a version of the Subaru Global Platform (SGP) understructure. Similar in concept to Toyota’s New Global Architecture and Volkswagen’s MQB platform, SGP is a modular chassis design from which the automaker can construct a variety of vehicles. SGP underpins the Ascent and Subaru’s Impreza compact car and should give the next-gen Outback a lighter yet stronger substructure, to the benefit of packaging, road manners, and fuel economy. Beneath the hood, expect a pair of new engines. Each would have four cylinders arranged horizontally, a Subaru tradition. This “boxer” layout tends to be more compact than the more traditional vertical “inline” or “V” cylinder configuration. That allows the engine to be placed lower and further back in the chassis, promoting a reduced center of gravity and more stable handling – a particular advantage for a taller-riding vehicle. Retiring the outgoing 2.5-liter four-cylinder with its 175 horsepower and 174 pound-feet of torque, expect the 2020 Outback to get the more modern 2.5-liter four Subaru uses in the 2019 Forester compact crossover. Expect 182 horsepower and 176 pound-feet of torque. It will be the new Outback’s standard engine and give models with it the 2.5i designation. Likely available as an option on the Limited and Touring grades will be Subaru’s new 2.4-liter turbocharged four-cylinder. It would replace a 3.6-liter boxer six of 256 horsepower and 247 pound-feet of torque. The turbo 2.4-liter four debuted in the Ascent, where it rates 260 horsepower and 277 pound-feet of torque. Don’t be surprised if Subaru detunes it to 240-250 horsepower and 250-260 pound-feet so as not to shade Ascent’s flagship status. Any diminution of power probably won’t be a performance issue because the new Outback will almost certainly weigh several hundred pounds less than the Ascent. As with the outgoing Outback, the sole transmission for both engines will be a continuously variable automatic (CVT). Engineers should continue to refine the 2020 Outback’s suspension, steering, and transmission to deliver a smoother ride, even more competent handling, and better overall performance. That would continue to mean you’ll be hard pressed to find better road manners in a crossover of this size and price. The redesigned Outback should also continue to be surprisingly capable off-road. It should retain Subaru’s excellent selectable X-Mode off-road powertrain calibration and ground clearance similar to the outgoing model’s generous 8.7 inches. Count on it. The new 2.5-liter engine employs direct fuel injection, which burns gasoline more efficiently than the port injection system on the 2019 Outback’s 2.5. Expect 2020 Outback 2.5i EPA ratings of 27/34/30 mpg city/highway/combined, versus the outgoing four-cylinder model’s 25/32/28. The turbocharged four could achieve ratings of 22/28/24 mpg, besting the 20/27/22 of today’s six-cylinder. All models would use regular-grade 87-octane gasoline. Subaru isn’t likely to recommend or require more expensive premium-grade 91-octane for the turbo. Possibly. Subaru added convenience features and made key safety features standard on every 2019 Outback and the ’20 should reflect that approach. Expect the 2.5 Base to include dual USB charging points for front-seat occupants, a 6.5-inch infotainment touchscreen with support for Apple CarPlay and Google Android Auto, and the usual array of power accessories. 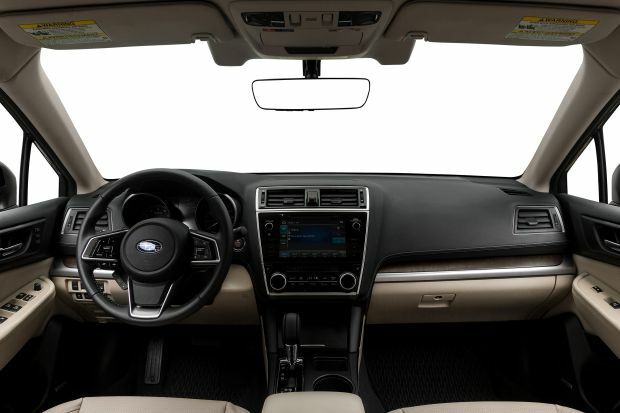 Also standard would be Subaru’s EyeSight safety system, which consists of adaptive radar cruise control, autonomous emergency braking, lane-departure warning, and automatic steering correction to keep you in your lane. The 2020 Outback Premium grades would likely add heated front seats and exterior mirrors, windshield wiper de-icer, dual-zone automatic climate control, fog lights, 8.0-inch infotainment screen, and a power driver’s seat. It’s possible that the blind-spot alert and rear cross-traffic detection systems that are optional on this model will become standard for 2020. The Limited grade would include blind-spot alert, leather upholstery, power liftgate, heated outboard rear seats, power front-passenger seat, keyless access with pushbutton engine start, and specific interior trim. Likely remaining optional on the Touring and Limited will be automatic high-beam headlights, power sunroof, and imbedded GPS navigation. The Limited would also offer optional steering-linked LED headlights. The range-topping 2020 OutbackTouring would include all Touring/Limited optional equipment and offer no other factory options. Look for them to increase, but the 2020 Outback should remain strong value for the money. Base-price estimates here include Subaru’s destination fee, which was $975 on the 2019 Outback. Estimated base price for the 2020 Outback 2.5i Base model is $28,000. Expect the 2.5i Premium to start around $30,000, the Limited around $34,500 and the Touring around $38,500. Equipping a Limited or Touring with the turbocharged four-cylinder engine would likely add around $2,000 to their base price. Look for the 2020 Outback to debut in concept form at the 2018 Los Angeles Auto Show, with a release date for the production car in summer 2019.